The Women’s Fellowship are noted for their pies. Father’s Day is Pie Sunday when the women provide pie for coffee hour which is especially to honor Dads that day. 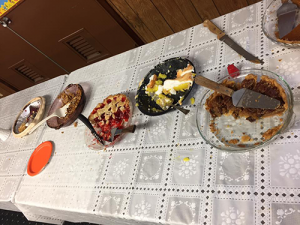 Then, in the Fall, there is a Pie Day in which everyone is invited to come to church to have a piece of pie, a cup of coffee or tea, and some time to just sit and chat.